In a mixing bowl, combine flour, soda, powder and salt. Whisk to combine. In the bowl of a stand mixer, add butter, brown sugar and sugar. Mix well using the paddle attachment. Combine eggs and vanilla in a pourable container. Pour eggs, one at a time, into sugar/butter mixture and blend well. Add peanut butter to butter mix and blend until well mixed. With mixer on low, spoon flour mix into butter mix. Blend until well combined. Add toffee bits and blend in slowly. Finish incorporating with a spoonula. Using a 1/4 C ice cream scoop, portion dough onto a cookie sheet that has been sprayed with non-stick baking spray. Place dough portions into the refrigerator for chilling. Once dough has firmed up, place the portions onto another prepared cookie sheet for baking. Place into a preheated 325 degree oven. Bake for 15 minutes. Remove cookie sheet and “thwack” it on the counter. Nice cracks will form. Place the cookies back into the oven and bake for an additional 15 minutes. For a chewier cookie, reduce final cooking time by 5 minutes. 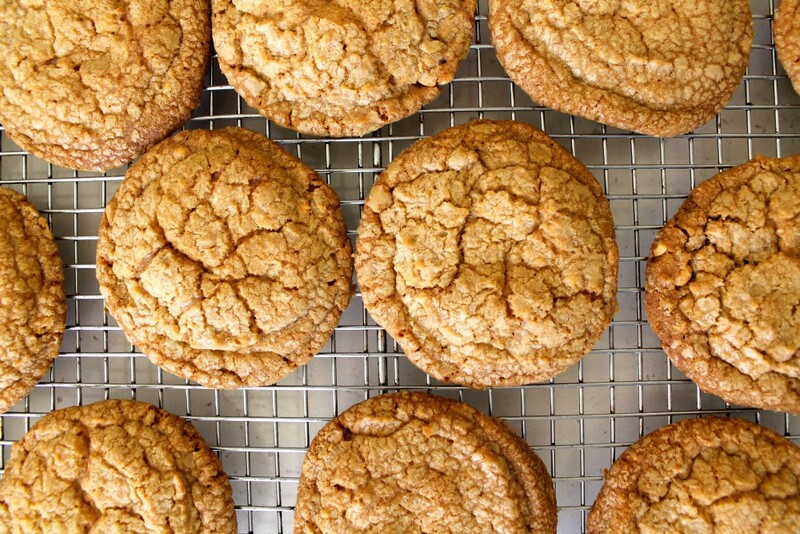 Remove cookies and place on a cooling rack. Once cookies have firmed up, place them directly on the rack for further cooling. Unused dough portions can be frozen for baking later.